The kitchen is where your body’s nourishment comes from, and your bedroom is where you get your daily dose of good night sleep. Even so, your home office is the nerve center of your entire home as it’s from where you work from so that you can finance all facets of your household. For it to maintain its function, a home office requires good organization. Good news is that you neither need to be an astute do-it-yourselfer nor have a huge budget to create a well-organized office. 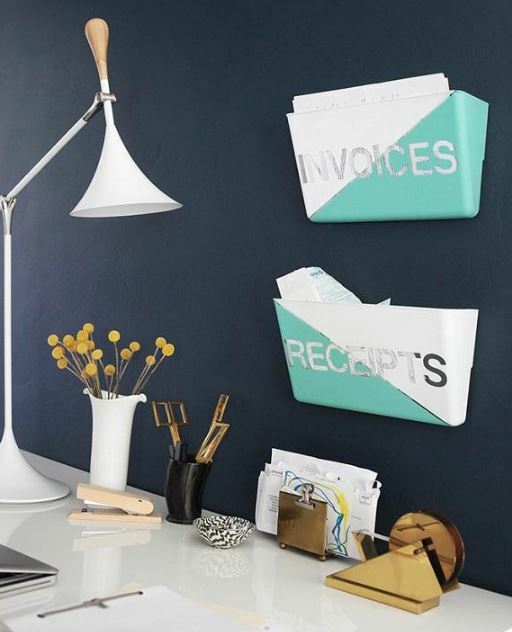 We are happy to share some simple, smart and cost-effective office organization ideas that will make your working space functional and dazzling. Don’t let the high price tag attached to rolls of cork deter you. 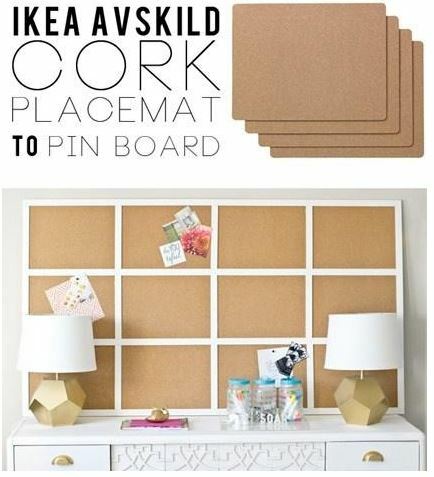 You can make yourself a large pin board by making use of cheap IKEA cork placemats and lattice from the local hardware store. Follow this tutorial for insights. 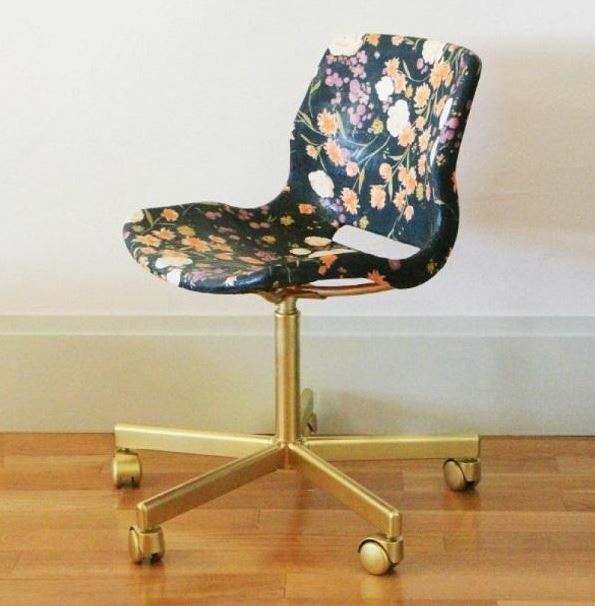 Nothing does a better job at changing that dull-looking office chair to a comfy glamorous office necessity like some fancy fabric and Mod Podge. When making a pick, be sure to choose a fabric that complements your style and color scheme. While electronics are every home’s must-haves, they can create a mess if their cables are left lying around. 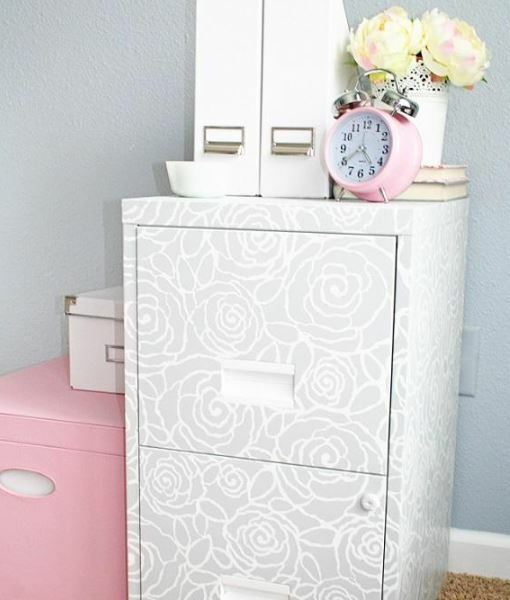 Keeping them in decorative paper boxes is a sure way to keep your office space tidy. 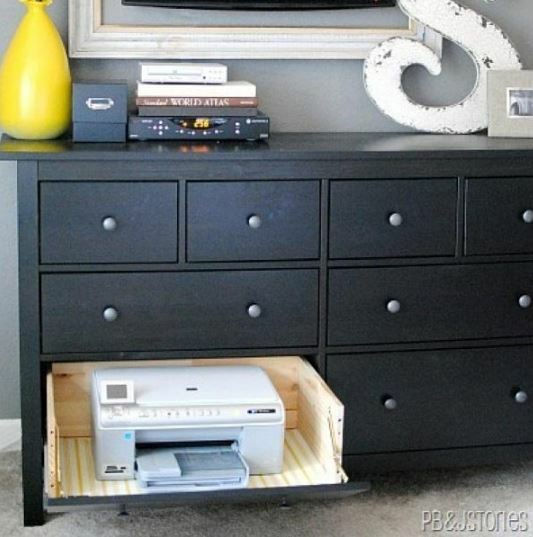 Believe it or not, your dresser is one handy piece of furniture that could help get the printer out of the way. 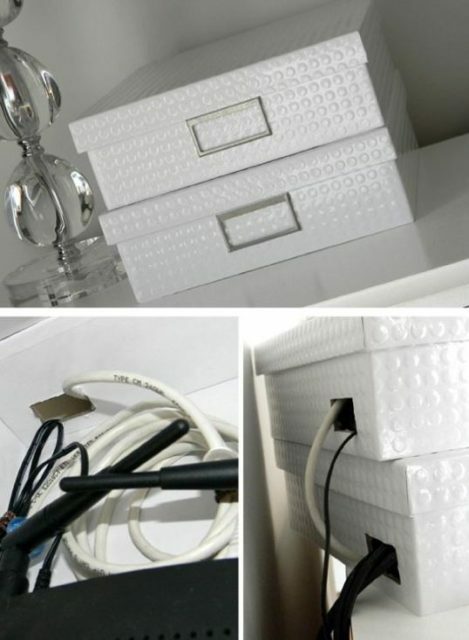 Check out this quick tutorial that gives you instructions on how to transform one of your dresser’s drawers into a perfect hideaway for your printer. While cereal boxes and old paper towel tubes are one man’s trash, they can prove to be quite valuable to you. 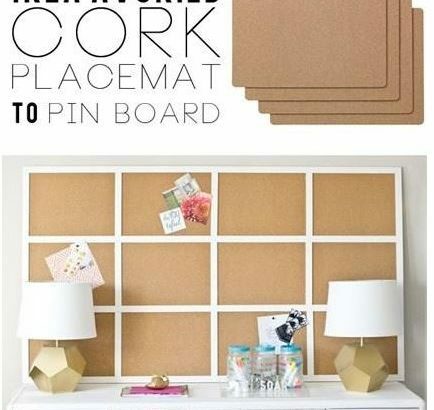 With glue, paint and scrapbook paper, you can easily craft your inexpensive yet alluring desk accessories from them. Ever spent a couple of precious minutes trying to make out what plug belongs to which electronic device? We all have. 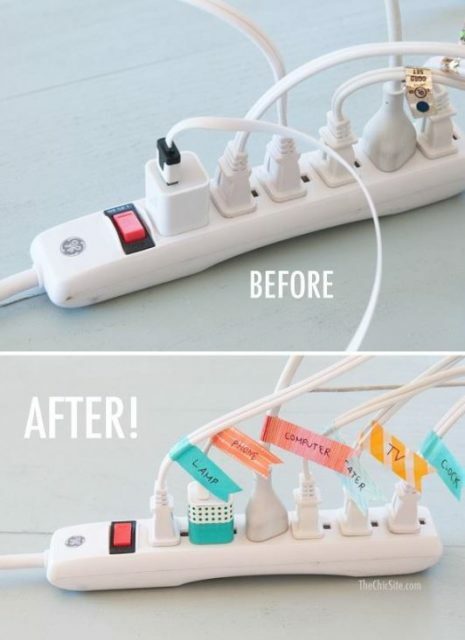 The best way to put a stop to the confusion is to use adorable washi tape tags to each plug. Do you always throw away soup cans? Don’t underestimate their worth. 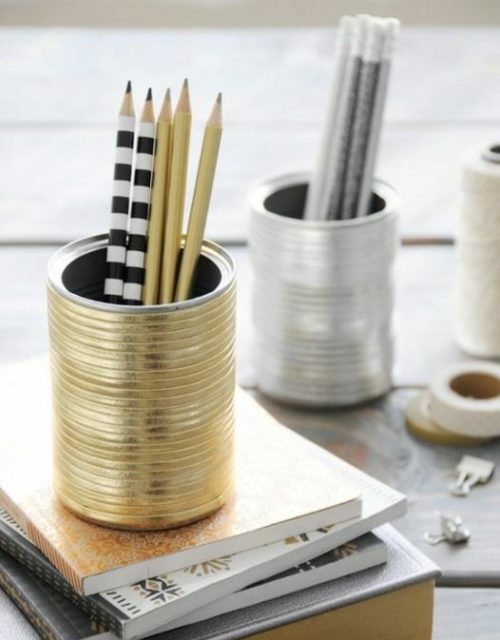 You can easily turn them into glamorous cups for pens and pencils. Just add metallic leather cording around the cans and secure with hot glue. New metal file cabinets don’t come cheap. Sadly, they usually carry some boring look that doesn’t match their hefty price tags. If you’re on a budget, it would be wise if you obtained use-but-good ones from thrift shops. You can then add a fresh coat of paint on them to give them superior aesthetic appeal. Do you have stack of files you keep meaning to put somewhere? 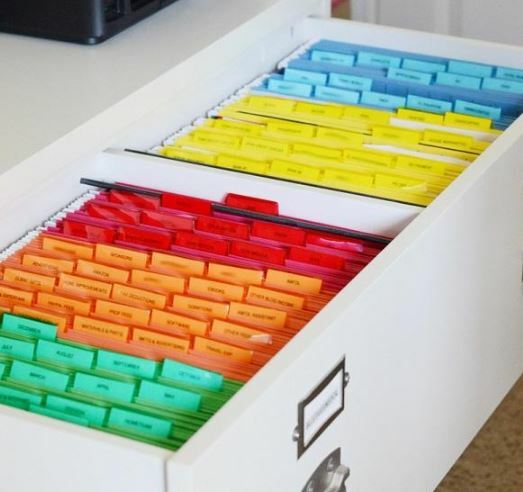 Disorganized files make for a cluttered mess that can make it hard for you to work efficiently. Before you over-think your labeling system, think of how a simple color-coded system will do and try it. Small office and craft supplies make for the most clutter in the office. Putting them in storage boxes is the sure way to get them out of the way. 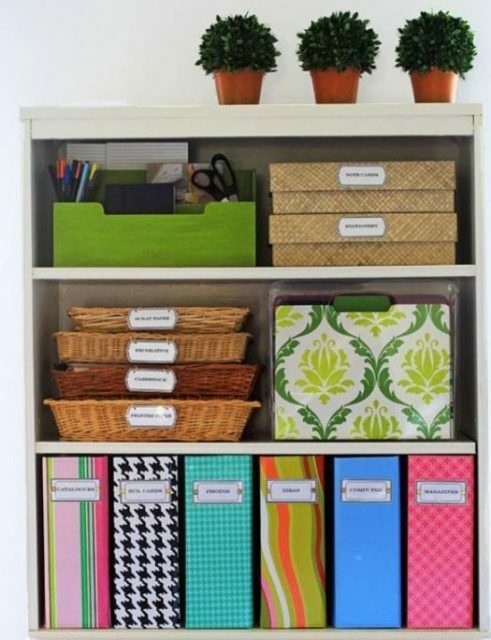 When painted and labeled, the storage boxes can double up as storage spaces and decorative pieces. Talk of hitting two birds with one stone! Storage boxes can take up lots of floor space. You can free most of that space by utilizing wall space near or above your work desk. With the things you need to put away in mind, you can design simple yet stylish wall pockets to keep all that clutter off your desk. Do you have a large collection of magazines that you just can’t find it in your heart to discard? Well, instead of letting them lie around, you can tuck them nicely into bookcases. 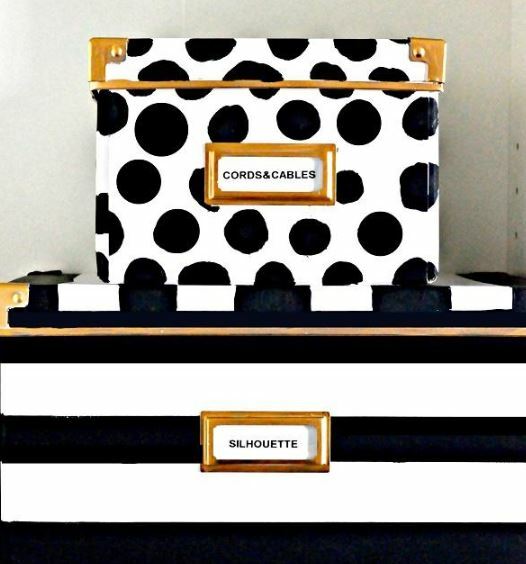 Wrap the storage boxes with pretty paper to add style. Also be sure to add labels to the boxes to ensure that you’ll retrieve any magazine issue you want with ease.